"How Do Catholics Practice Lent?" Q: What is Lent? Lent is the forty-day period before Easter, excluding Sundays, that begins on Ash Wednesday (the day on which the faithful have their foreheads signed with ashes in the form of a Cross) and ends just before the Mass of the Lord’s Supper begins on the evening of Holy Thursday. Ash Wednesday is also a day of fast and abstinence. As soon as the Mass of the Lord’s Supper starts, a short liturgical season begins: The three days of the Holy Triduum. This does not mean that our Lenten sacrifices should end as they should be observed through Good Friday and Holy Saturday—the solemn and sacred days of Christ’s death and resurrection. Q: What are appropriate activities for ordinary days during Lent? Giving up something we enjoy for Lent, doing something “extra,” such as corporal or spiritual works of mercy for others, prayer, fasting, almsgiving, abstinence, going to confession, and other acts expressing repentance in general. Q: Is the custom of giving up something for Lent mandatory? No. However, it is a salutary custom, and parents or caretakers may choose to require it of their children to encourage their spiritual training, which is their prime responsibility in the raising of their children. Q: What is a day of fast and abstinence? Under current canon law in the Western Rite of the Church, a day of fast is one on which Catholics who are eighteen to sixty years old are required to keep a limited fast. In this country, one may eat a single, normal meal and have two snacks, so long as these snacks do not add up to a second meal. Children are not required to fast, but their parents must ensure they are properly educated in the spiritual practice of fasting. Those with medical conditions requiring a greater or more regular food intake can easily be dispensed from the requirement of fasting by their pastor. A day of abstinence is a day on which Catholics fourteen years or older are required to abstain from eating meat (under the current discipline in America, fish, eggs, milk products, and condiments or foods made using animal fat are permitted in the Western Rite of the Church, though not in the Eastern Rites). Again, persons with special dietary needs can easily be dispensed by their pastor. Q: Is there a biblical basis for abstaining from meat as a sign of repentance? Yes. The book of Daniel states, "In the third year of Cyrus, king of Persia . . . 'I, Daniel, mourned for three weeks. I ate no choice food; no meat or wine touched my lips; and I used no lotions at all until the three weeks were over'" (Daniel 10:1-3). Q: In addition to Ash Wednesday, are any other days during Lent days of fast or abstinence? Yes. All Fridays during Lent are days of abstinence. Also, Good Friday, the day on which Christ was crucified, is another day of both fast and abstinence. All days in Lent are appropriate for fasting or abstaining, but canon law does not require fasting on those days. Such fasting or abstinence is voluntary, like a freewill offering. Q: Why are Fridays during Lent days of abstinence? This is because Jesus died for our sins on Friday, making it an especially appropriate day of mourning our sins (just as Sunday, the day on which He rose for our salvation is an especially appropriate day to rejoice) by denying ourselves something we enjoy. During the rest of the year Catholics in this country are permitted to use a different act of penance on Friday in place of abstinence, though all Fridays are days of penance on which we are required to do something expressing sorrow for our sins, just as Sundays are holy days on which we are required to worship and celebrate God's great gift of salvation. Q: Why are Sundays excluded from the reckoning of the forty days? Because Sunday is the day on which Christ arose, making it an inappropriate day to fast and mourn our sins. On Sunday we must celebrate Christ's Resurrection for our salvation. It is Friday on which we commemorate His death for our sins. The Sundays of the year are days of celebration, “mini Easters” and the Fridays of the year are days of penance. Q: Why are the forty days called Lent? They are called Lent because that is the Old English word for spring, the season of the year during which they fall. This is something unique to English. In almost all other languages its name is a derivative of the Latin term Quadragesima, or "the forty days." Q: Why is Lent forty days long? Because forty days is a traditional number of discipline, devotion, and preparation in the Bible. Thus Moses stayed on the Mountain of God forty days (Exodus 24:18 and 34:28), the spies were in the land for forty days (Numbers 13:25), Elijah traveled forty days before he reached the cave where he had his vision (1 Kings 19:8), Nineveh was given forty days to repent (Jonah 3:4), and, most importantly, prior to undertaking His ministry, Jesus spent forty days in the wilderness praying and fasting (Matthew 4:2). Since Lent is a period of prayer, fasting & almsgiving, it is fitting for Christians to imitate their Lord with a forty-day period. Christ used a forty-day period of prayer and fasting to prepare for His ministry, which culminated in His death and resurrection; and thus it is fitting for Christians to imitate Him with a forty day period of prayer and fasting to prepare for the celebration of His ministry's climax, Good Friday (the day of the crucifixion) and Easter Sunday (the day of the resurrection). Thus the Catechism of the Catholic Church states: "'For we have not a high priest who is unable to sympathize with our weaknesses, but one who in every respect has been tested as we are, yet without sinning’ [Heb 4:15]. By the solemn forty days of Lent the Church unites herself each year to the mystery of Jesus in the desert." (CCC 540). Q: Are acts of repentance appropriate on other days during Lent? Yes. 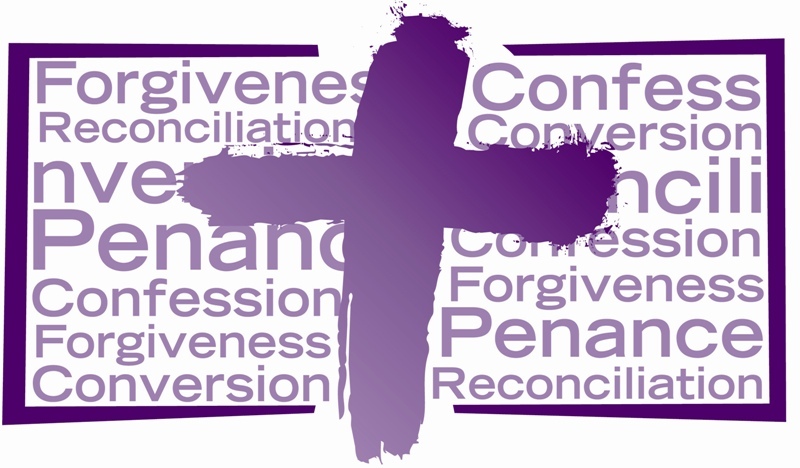 Thus the Code of Canon Law states: "All Fridays through the year and the time of Lent are penitential days throughout the universal Church" (CIC 1250). Q: Why are acts of repentance appropriate at this time of year? Because it is the time leading up to the commemoration of Our Lord's death for our sins and the commemoration of His resurrection for our salvation. It is thus especially appropriate to mourn the sins for which He died. Humans have an innate psychological need to mourn tragedies, and our sins are tragedies of the greatest sort. It is thus appropriate to have set times of repentance. Lent is one of those set times. Q: Aside from Ash Wednesday, which begins Lent, what are its principal events? There are a variety of saints' days which fall during Lent, and some of these change from year to year since the dates of Lent itself change based on when Easter falls. However, the Sundays during the Lenten season commemorate special events in the life of Our Lord, such as His Transfiguration and His Triumphal Entrance into Jerusalem on Palm Sunday, which begins Holy Week. Holy week climaxes with Holy Thursday, on which Christ celebrated the first Mass; Good Friday, on which He was Crucified; and Holy Saturday—the last day of Lent—during which Our Lord lay in the Tomb before His Resurrection on Easter Sunday, the first day after Lent.